Entering Cambridge from the south, via the A1307 (Hills Road), turn left into Long Road/A1134 and left into Robinson Way (on the western edge of the Addenbrooke’s campus). At the roundabout turn right into Francis Crick Avenue (the LMB building will be on your right). Follow the signs for the LMB building visitor car park (first turning onto the LMB’s site). From London, approaching Cambridge on the M11, leave the motorway at Junction 11 and follow the signs for the A1309 South Cambridge. From the A1309, turn right – almost immediately – on to the Addenbrooke’s Road (signposted Shelfords, Hospital and the Biomedical Campus). Continue along the Addenbrooke’s Road (go straight over at the Shelford Road traffic lights, bear right at the first roundabout and over the railway bridge). At the second roundabout go straight ahead onto Francis Crick Avenue. The LMB building is located straight in front of you as you drive along Francis Crick Avenue. Follow the signs for the LMB building visitor car park (second turning onto the LMB’s site). Using a satnav – The LMB postcode is CB2 0QH. However until mapping systems are fully updated the postcode CB2 0RE will bring you to Robinson Way, a short distance from the LMB building. For maps to the campus, please see the the section at the top of the page. The LMB has limited parking for visitors. Please contact your host or LMB Reception (01223 267000) to reserve a car parking space for your visit. 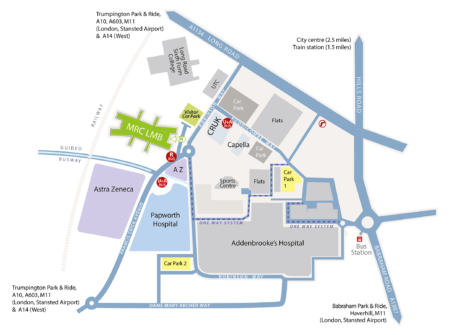 Alternatively, visitors can use one of the hospital’s patient and visitor car parks. The nearest is the yellow car park 2 (charges apply). The nearest Park and Ride site is the Trumpington Road site. Use the ticket machine to buy a ticket specifically for the Addenbrooke’s hospital campus. Parking costs £1. Nearly 60 buses an hour, including the Cambridgeshire Guided Busway, serve the Addenbrooke’s campus on weekdays, with many services originating from within the City of Cambridge. The Cambridgeshire Guided Busway services R, A and U stop on Francis Crick Avenue close to the LMB. London is less than one hour away by train. There are frequent train services (from London King’s Cross and Liverpool Street) between the two cities until late at night. From the station there are many buses to the Addenbrooke’s campus, including the Cambridgeshire Guided Busway services R, A and U that stop on Francis Crick Avenue close to the LMB. Alternatively you can take a taxi to site. London Stansted is the closest airport to Cambridge (approx. 50 mins by road). Both Ryanair and easyJet offer cheap flights from Europe to London Stansted. London Gatwick and London Heathrow are approx. 2 hours by road. Luton Airport can also be used. Stansted airport is on a direct rail link to Cambridge. Services run regularly, operated by National Express East Anglia and CrossCountry Trains. Heathrow Express to Paddington, then London Underground (Circle Line) to King’s Cross St Pancras then train to Cambridge. Gatwick Express to London Victoria, then London Underground (Victoria Line) to King’s Cross St Pancras then train to Cambridge. National Express operate regular daily coach services from the airports to Cambridge. See the National Express website for full details. There are taxi ranks at the rail station and city centre. Please give the taxi driver the correct address details for the LMB building. 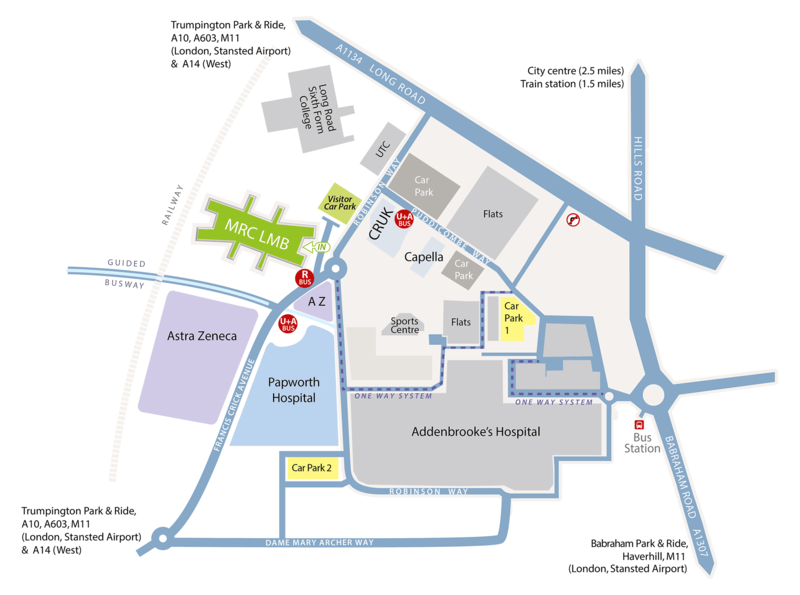 The Addenbrooke’s campus is a 30-45 minute walk from the Rail Station along the Cambridgeshire Guided Busway and about an hour’s walk from the centre of town. Cambridge has some of the best provision of cycle routes and lanes in the UK and cycling is a very popular way to get to the Campus. From Cambridge station there is a direct cyclepath beside the Guided Busway and there are also attractive off-road routes direct from the local area. The County Council maintains detailed maps of cycle routes in Cambridge and these show numerous cycle routes, including National Cycle Route 11, that pass through the Campus. Cycle Streets provide an on-line journey planner to help you plan your route. You can specify the type of route you prefer – fastest, balanced or quietest. Once you arrive at the LMB there is cycle parking available outside the main entrance to the building.